This is a nice late Renaissance silver reliquary cross pendant, dating to the 16th - 17th century A.D. The cross is hollow and profusely engraved, it bears the IHS monogram on the obverse, with the Maria monogram on the reverse. It is intact with three suspension loops, to hang pearl drops. 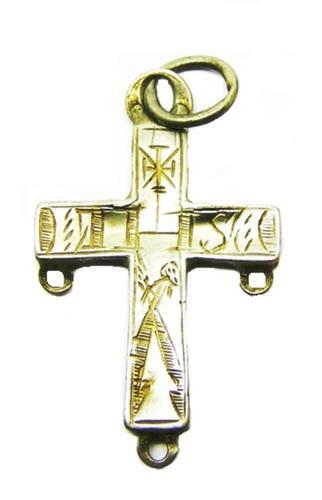 This cross may once have contained a memento or relic, as was the custom. Sadly it has slight damage to one face, it is, however, intact and can be worn again on a simple silver chain. DATE: c. 1550 - 1650 A.D.
PROVENANCE: Ex. private collection. Beauvoir, France.